Offering supply and installation of tactile ground surface indicators, stainless steel tactile studs, bars, and stair nosings for indoor and outdoor areas. Stainless steel tactile studs and Tredfx Aluminium Nosings we're installed onto this memorial to enhance safety for all visitors. Truly classy, modern and architecturally please Tredfx Fusion Range Stair Nosings and TacStud Stainless Steel Studs installed at Mecca Maxima Wellington. A great job with an even greater finish! High quality carborundum and stainless steel stair treads and nosings for aiding the visually impaired and hazardous areas. Staff and contractors in New Zealand provide supply and installation services for our Tactile Ground Surface Indicator range for major and minor projects. "To inspire, assist and exceed the standards of every individual and entity with which we come in contact, and to drive for and deliver safer environments in every circumstance we are involved in." A wide range of Tactiles, Stair Nosings, Anti-slip & Accessibility products. 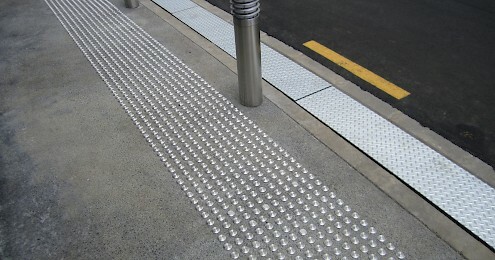 Total Tactilez™ presents a diverse and unique range of Tactile Ground Surface Indicators, Stair Nosings, Floor Trims, Accessibility and Anti Slip Products that create the safer public environments of today and the future. 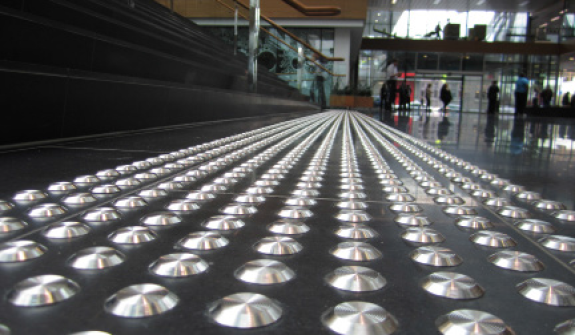 Tactile Ground Surface Indicators installed in pedestrian/public areas create safer walking spaces for everyone, but particularly those with impaired vision, while increasing the anti-slip rating of your surfaces. 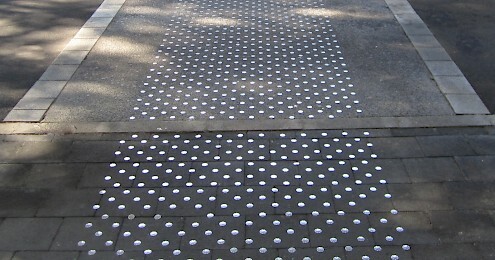 The raised bars or studs of the Tactile are felt through the feet or cane to direct visually impaired people along the pedestrian path, and the bright color contrast means that the Tactiles can be detected visually if possible. 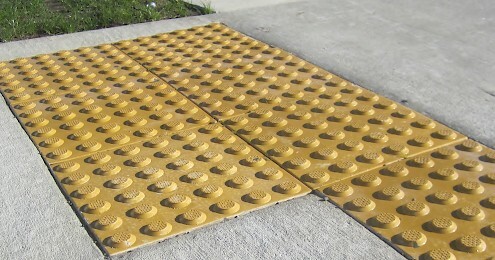 Tactile Ground Surface Indicators help you create safe walking spaces for all people to navigate with dignity and independence. Stair Nosings are designed to create a safer step edge by providing a visual contrast to the surrounding substrate. 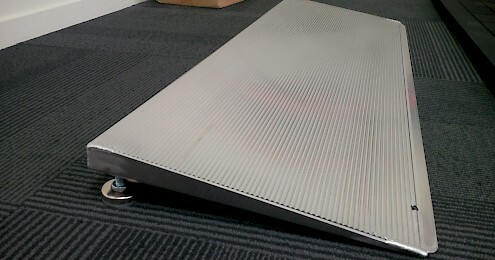 These are designed with leading edge anti-slip properties creating a safer step edge in all environments. 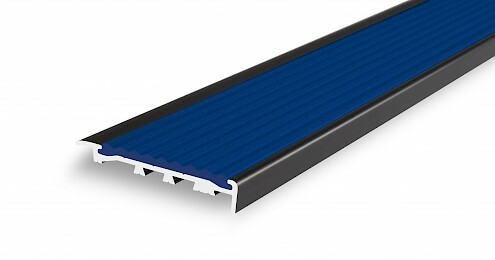 With our architectural and safety packed designs, Total Tactilez Stair Nosings provide the ultimate step edge safety and protection for surrounding floor coverings. Developed in consultation with architects, RFNZB Foundations, Local Government Boards, Engineers, Designers, and Planners, we can provide a custom solution for you, including tactile hazard and directional indicators, anti-slip surface treatments, a wide range of stair nosings and various other surface improvement products. Total Tactilez is proud of our reputation as creators of safer public environments, covering New Zealand, Australia, and the Pacific. 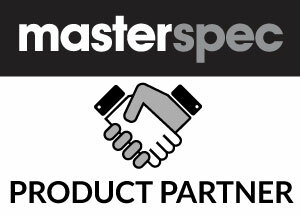 Total Tactilez has grown to establish a network that allows us to provide our unique tactile indicator and anti slip products range at the right price to all sectors of New Zealand and the South Pacific Region. Our service level and experience count, ask how we can help! We care about our customers. Total Tactilez has become a major and leading supplier of Tactile Ground Surface Indicators to Construction Contractors and are seen as a preferred supplier to many. Experience our service to provide value to your project.